Hymn: 217, All glory laud and honour. May I speak in the name of + the Father, the Son and the Holy Spirit. Throughout this week, as we journey together through Holy Week, we continue the gradual build-up from Palm Sunday, with services each evening in this group of parishes. We are here in Saint Mary’s, Askeaton this evening [10 April 2017], in Saint Brendan’s, Tarbert, tomorrow [11 April], then we journey on to Rathkeale on Wednesday, to Castletown for the Maundy Eucharist on Thursday evening, so that we can mark Good Friday prayerfully and appropriately in Saint Mary’s Roman Catholic Church, Rathkeale, at noon on Friday and in Saint Mary’s Church, Askeaton that evening. That stepping up of the tempo is reflected in the Book of Common Prayer, for example, where we are provided with the same Post-Communion prayer for today, tomorrow and Wednesday, and then another Post-Communion Prayer and a choice of collects on Maundy Thursday. The earliest reference to marking this week with special observances is found in the late third century and early fourth century. The Apostolic Constitutions (v. 18, 19) tell us abstinence from meat was expected for all the days of this week, and in addition there was an absolute fast on the Friday and Saturday. Holy Week became an established custom and tradition, and there are pilgrims’ accounts giving complete details of the observance of Holy Week in Jerusalem from around 381 to 384. The days between Palm Sunday and Maundy Thursday are known as Holy Monday (Fig Monday), Holy Tuesday, and Holy Wednesday, or sometimes Spy Wednesday. The Gospel readings on these days recount events not all of which occurred on the corresponding days between Christ’s entry into Jerusalem and the Last Supper. For example, today’s Gospel [Monday] tells of the Anointing at Bethany (John 12: 1-11), which took place before Palm Sunday (see John 12: 12-19). In the Western Church, this Monday in Holy Week is not a major feast. But tradition says the cleansing of the Temple in Jerusalem took place on this Monday. This is when Christ overturns the tables of the money-changers, saying to them: ‘It is written, “My house shall be called a house of prayer”; but you are making it a den of robbers’ (Matthew 21: 13). 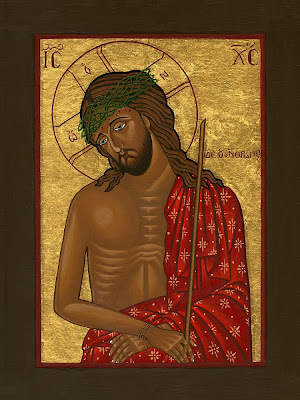 In the Orthodox tradition, the service of Matins on these first three days of Holy Week – Monday, Tuesday and Wednesday – is known popularly as ‘The Bridegroom Service,’ and includes the ‘Bridegroom Prayer.’ An icon of Christ the Bridegroom is displayed in the centre of the church, showing Christ wearing the robe of mockery and crowned with the crown of thorns. The theme of Christ as the Bridegroom of the Church is extended by drawing on the parable of the ten bridesmaids. ● The story of Joseph (Genesis chapters 37 and 39-40), whose innocent suffering and his persecution by Potiphar’s wife prefigures the suffering of the innocent Christ. ● The cursing of the barren fig tree by Christ on his way into Jerusalem (Matthew 21: 18-22). 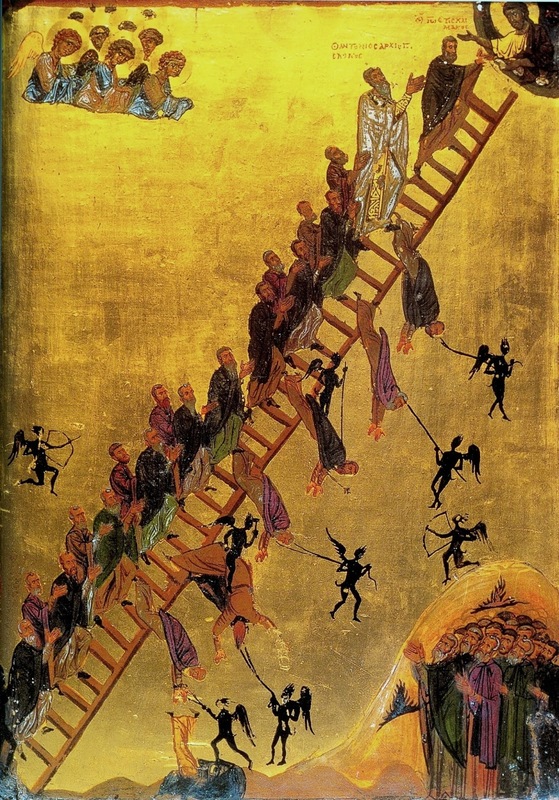 This serves as an image of the judgment that befalls all of us if we do not produce the fruits of repentance and holy living. ● The demand by the mother of Zebedee’s sons for a place of privilege in the Kingdom for James and John (Matthew 20: 20-28). James and John are seeking pride of place in the Kingdom, in sharp contrast to the humility of Christ, who renounces his status as Creator in order to suffer with and for those he has created. On this day, do I have ambitions for myself, like their mother had for James and John? Or am I prepared for the cost of discipleship, of following Christ who renounces all for the sake of all? (Revd Canon Professor) Patrick Comerford is Priest-in-Charge, the Rathkeale and Kilnaughtin Group of Parishes. This Holy Week Reflection was prepared for Saint Mary’s Church, Askeaton, on 10 April 2017. If Holy Trinity Church, the Church of Ireland parish church, dominates the sky line at the west end of Rathkeale, with its prominent position on a raised site above the banks of the River Deel, then the east end of the town is dominated by the Bank of Ireland, which towers above the other late Georgian and early Victorian shopfronts and buildings at the east end of the Main Street. This bank branch, built around 1870, was one of the last great buildings designed shortly before his death by the Dublin-based architect and civil engineer William Francis Caldbeck (1824-1872). William Francis Caldbeck, a son of Richard Caldbeck and grandson of John Frederick Caldbeck, was born ca 1824. His great-grandfather, William Caldbeck, of Clondalkin and Larch Hill, Whitechurch, Co Dublin, was a barrister, gunpowder-miller and amateur architect. William Francis Caldbeck was a pupil of the architect, William Deane Butler, before setting up his own practice at the age of 20 in 1844. Caldbeck was the architect to the National Bank, and was closely associated with the architect John Ryan ‘for many years … in the design and carrying out of many important works.’ He exhibited at the Royal Hibernian Academy through the 1840s, 1850s and 1860s. Caldbeck’s pupils and assistants included John Michael Barry. In Thom’s Directory, he is also described as ‘consul for Uruguay and Montevideo’ from 1867 until his death in 1872. The bank Caldbeck designed for the National Bank in Rathkeale stands at a prominent position on the Main Street. His design is a variation of one that is found in many Irish towns. The masonry and detailing are clearly the work of skilled craftsmen. The diversity of treatment of both the stone and the openings adds to the elegance and charm of this attractive building. This is an attached five-bay three-storey bank, with a two-storey return to the north (rear), having a lower gabled single-bay two-storey block to the rear. There is a carved limestone corbelled cornice to the south or front elevation. There are cut limestone walls with dressed flush limestone quoins, and channelled limestone to the front elevation below an impost course. The round-headed door openings to the front elevation have timber battened doors and fanlights, recessed within carved limestone square-headed surrounds with cornices, incorporating Corinthian-style columns, imposts, and fluted arches with decorative faced keystones. The round-headed openings to the ground floor have one-over-one pane timber sliding sash windows with fanlights, stepped carved limestone surrounds incorporating decorative keystones and shared impost course. On the first floor, the square-headed window openings have one-over-one pane timber sliding sash windows and a continuous dressed limestone sill course. The windows to the outer bays have carved limestone surrounds with flanking pilasters and fluted consoles and pediments. The windows to the central bays have carved limestone shouldered surrounds and cornices. The camber-headed window openings on the second floor have shouldered carved limestone surrounds, cut limestone sills and two-over-two pane timber sliding sash windows. The square-headed openings to the rear have dressed flush limestone surrounds and voussoirs, some with timber sliding sash windows, and some with replacement windows. The round-headed openings to the return and to the ground floor at the rear have dressed flush limestone surround and voussoirs. The flat arched opening to the gabled rear block has a tripartite one-over-one window flanked by a two-over-two pane timber sliding sash window. The carved elements such as the doorcases and window surrounds give a lively appearance to this solid stone building. The style, form and detailing are typical opulent features of banks of the late Victorian era in Ireland. Nearby, the Rathkeale branch of Allied Irish Bank stands on the opposite side of Main Street, on the corner of Bank Place. Although architectural websites and archives identify no architect for this building, it is probably the work of the Cork-based architect Arthur Hill (1846-1921), who designed many other Munster and Leinster branch banks in Munster, including those in Mitchelstown, Buttevant, Dunmanway and South Mall, Cork. Arthur Hill, the son of Henry Hill, was born in Cork on 8 June 1846. He studied at the local School of Art and then studied engineering at Queen’s College, Cork. He then moved to London, where he worked in the office of Thomas Henry Wyatt (1866-1867) and attended the Royal Academy Schools, the West London School of Art, classes at the Architectural Association and lectures at University College. Between 1866 and 1874, Hill won several awards and it seems he joined his father’s architectural partnership at the end of 1869. He continued to practise in Cork for the rest of his active professional life, a period of 47 years. In 1891, Hill was appointed a lecturer in the new Architectural Section in the Engineering Department at Queen’s College, Cork. He had a deep interest in the architecture of the past, especially in Celtic Romanesque architecture. He was recognised for his measured drawings of Ardfert Cathedral, Kilmalkedar and Templenahoe, his studies of Cormac’s Chapel in Cashel, and his drawings of the ‘French Prison’ in Kinsale. Hill married Flora May Houghton from Stoneby, New Brighton, in 1881 and they were the parents of two sons and a daughter. In 1909, his elder son, Henry Houghton Hill, joined his practice. Hill retired in 1917 after a severe paralytic stroke. But he continued to take an active interest in architecture until he died on 24 February 1921 at Redgarth, Douglas Road, Cork, the house he designed for himself. He had ‘finished his last little drawing only five days before,’ according to his son. The bank Hill seems to have designed in Rathkeale dates from ca 1880. It is a detached five-bay two-storey over half-basement building, with two-bay two-storey returns to the south or rear. The building has a hipped slate roof with terracotta ridge crestings, a saw-tooth pattern brick eaves course and cast-iron rainwater goods. There is a shouldered square-headed opening to the front elevation, approached by a double-sided flight of cut limestone steps. The timber battened door with has a limestone surround with quatrefoil and circular recesses, a gabled canopy with a trefoil hood, a carved finial and carved brackets. On the ground floor, the round-headed openings on the north (front) and west (side) elevations have round-headed, one-over-one pane timber sliding sash windows, carved pointed arch surrounds to heads, and a carved limestone continuous impost course and sill course. The square-headed opening to the ground floor west elevation has a shouldered limestone surround to the head and sharing impost and sill courses, with other windows to the same level. On the first floor, there are square-headed openings to the first floor, with those on the north (front) and west elevations having one-over-one pane timber sliding sash windows, carved shouldered surrounds to the heads and a continuous carved limestone sill course. There square-profile cut limestone piers to entrance, a rendered boundary wall to the south-west, and camber and square-headed openings to the rear with replacement windows. The imposing appearance of this bank is heightened by its raised ground floor, the flight of steps to the entrance and the elaborate doorcase. In our pilgrimage and journey in Lent we have arrived at Holy Week, the last week in Lent. Every evening in Holy Week, there are special services in the churches in the Rathkeale and Kilnaughtin Group of Parishes. This evening’s service (10 April 2017) is in Saint Mary’s Church, Askeaton, at 8 p.m. This week, from Palm Sunday (9 April) until Holy Saturday (15 April), the USPG Lent Prayer Diary is following the narrative of Holy Week. The topic was introduced yesterday in an article in the Prayer Diary by Paulo Ueti, a bible scholar and theologian in the Anglican Church of Brazil. Jesus entered the temple area and drove out all who were buying and selling. In our consumerist world, pray that we might instead store treasure in heaven.